We seem to be living in more uncertain times if you listen the news. 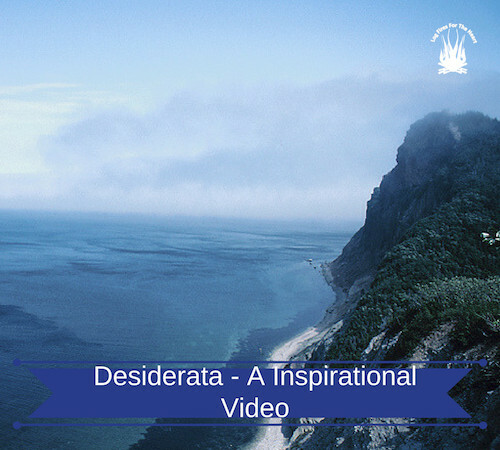 If you want something uplifting, then listen and read below the fantastic words for life from the Desiderata video below. In our own lives, we all have bad days to cope with. Some we can kind of see coming, some are unexpected and some, to be honest, we bring upon ourselves. We all mess up and fail in life. Indeed, based on my record, if mistakes were the barometer of wisdom, I would be the wisest person on the planet…. If you have made mistakes and believe me I have made many, I know where you are coming from. Most of the times you can recover and come out the other side a stronger and in cases better individual. It’s how you deal with the bad times in life that will determine how your life will pan out. My dogs have been such a help through these times. One of the loveliest poems I have read is the well-known poem called Desiderata by Max Ehrmann. The Latin meaning literally means: “something that is needed or wanted”. It’s been hanging in my room for years and when needed I go and read it. I just find it so uplifting and hopeful and I do hope that you do also. I read somewhere a long time ago and I have found it to be so true. Sometimes things don’t turn out the way you plan. Sometimes they turn out even better. I remember this from college in the late 70’s when the poster seemed to be everywhere. I also remember Leonard Nimoy’s spoken version as well. I’ve always found it very motivating and inspirational. I’d never thought to associate it with dogs, but they do provide some of the same comforting hope. I am also an animal love, and I feel like they save me as much as I save them. I can see how you would connect them to these words as an inspiration. There is definitely a lot of negativity in the world, and it’s up to each of us to find what pulls us through personally. Thanks so much for sharing. What an incredible poem, I don’t know why I haven’t heard of it before. It is really inspiring and enlightening and makes you look into yourself and try and improve. I know I am an impatient person, I get irritated easily, especially when doing something I would prefer not to do. Our two dogs, which we got at 8 weeks old, have taught me so much. If I am impatient, they reflect my mood and I can see my own behaviour in them. If I’m calm, they too are calm and will listen to me if I give them calm and soft commands. Dogs are amazing creatures and will teach you about yourself so you can change for the better. If your dog is badly behaved, look to yourself for the answer! Great poem, great post. Thank you for taking the time to post. Yes it is an incredible poem, one I find such inspiration from. Hi John, thank you for this post and I loved the wording of the poem. I have a dog myself and they are great to have around when you are struggling or things just aren’t go to plan as they will always stay by your side. It is amazing how they can sense these things and want to help you just by being near to you. In the endeavors of trying to start my own business I have had many rough and overwhelming days. I think I may do the same as you have and print ans post this somewhere. It really speaks volumes. As much as dogs can help lessen the pain, I think the real value of the poem comes from how it reminds us to not be so hard on ourselves, while still maintaining discipline. It really reinforces the “goldilocks” idea that I see permeate through almost all areas of life. There is always and ideal “just right” position to be in with everything. Thank you again. The ubiquitous problems of modern life highlighted really do make you think and appreciate what we have. I will be returning to this poem in times of doubt almost certainly. Taking the time to visit your website is like finding a good place to take a break. As you said, today we are all living day by day with many changes, we do not know what is going to happen tomorrow or the next hour, but you provide us with a good poem to read. I haven’t read it before or I haven’t be in the moment to pay attention to it. Today I enjoyed reading it, and I bookmarked as I’m sure I’ll come back to read it again. I am really glad that you enjoyed reading Desiderata. I also come back to it many times, because I find it so uplifting.